Hi! I’m Patri from @patriswholeomelife on Instagram. There is nothing I love more than a big bowl of porridge for breakfast. I make overnight oats during the summer and warm stove-top cooked porridge during the winter. Porridge is so versatile and you can literally add anything you want to it. 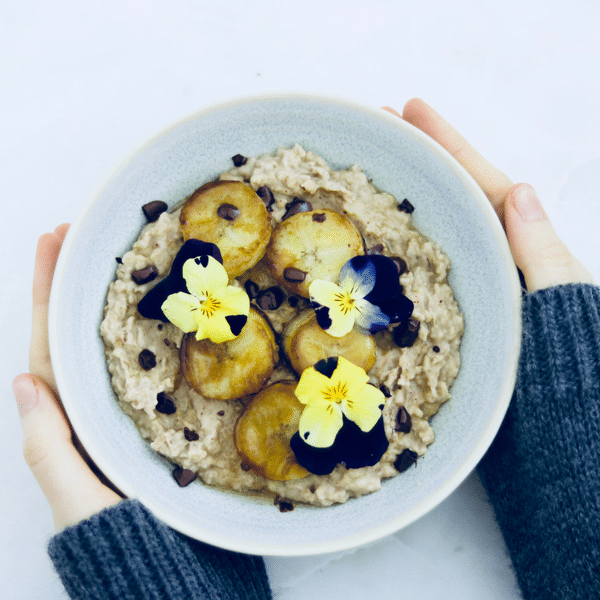 This recipe is loaded with good carbs from the oats and the banana, and heart healthy fats from the hazelnut milk and olive oil. If you don’t know what to make for breakfast on Christmas day, this would be amazing. You can simply multiply the recipe by the amount of people you want to feed. This will fuel you for the rest of the morning and give you long lasting energy – Because no one likes sugar spikes! Add all of the ingredients of the oats into a small sauce pan and bring to a simmer. Simmer, stirring every few seconds so that nothing sticks to the bottom of the pan, for 10-15 minutes or until the oats have thickened and are all the way cooked. For the caramelised banana: to a non-stick pan add the olive oil and coconut sugar and turn the heat to medium-low. Once all the sugar has dissolved, add the bananas to the pan and sprinkle with cinnamon. Cook on medium-low heat for a minute on each side or until they are nice and golden. Once everything is cooked, add the oats to a bowl, top with the caramelised bananas (I recommend discarding the sugar/olive oil mixture just in case there is any burned sugar) and maple syrup. Voila! There you have it, a delicious breakfast ready to serve! Tip: Best served in our 100% Bamboo Bedding – Click here to check out our range of colours!